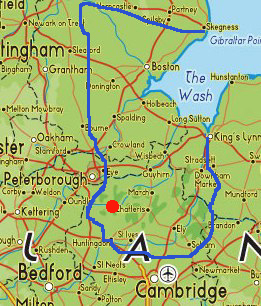 The approximate extent of the Fens or Fenland in Eastern England is shown by the blue line. The red circle is the location of Holme Fen. Perhaps not unsurprisingly the lowest point in Britain is in the Fens or Fenland, the area of marshland or former marshland in eastern England that lies around the coast of the Wash, most of which lies in Cambridgeshire and Lincolnshire. Much of the Fens was originally fresh- or salt-water wetlands, but they have artificially drained since the 17th century and are now a very fertile area of arable land, which continues to be protected from floods by drainage banks and pumps. As a result of being drained most of the Fens lie within a few metres of sea level like similar areas in the Netherlands. Near the village of Holme in Cambridgeshire, is Holme Fen National Nature Reserve which is situated on what was the shore of the Whittlesey Mere which was drained in 1851 after years of falling water levels due to the draining of the surrounding fen. At the time an oak post was sunk into the ground alongside the minor road that runs through the reserve resting on the clay beneath the peat with the top flush with the peatland surface to monitor the shrinkage of the land as it continued to be drained. Holme Fen post which was sunk in 1851. Originally the pyramid at the top of the post was at ground level. The collar, to which the steel guys are attached, is 2.75m above the ground, which is close to sea level. A few years later this was replaced with an iron post, believed to have been part of the Crystal Palace. 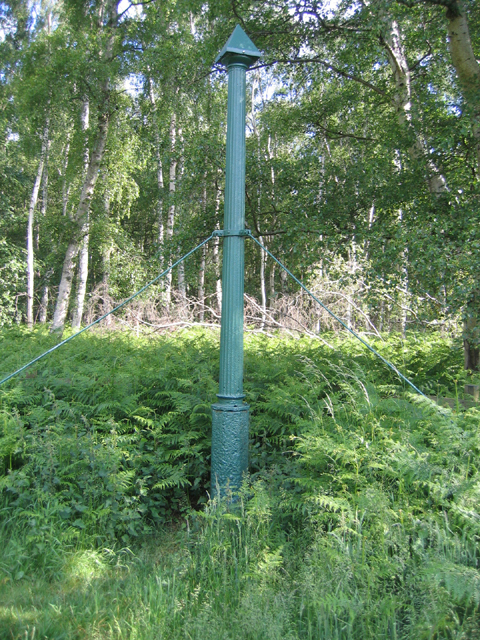 In 1957 steel guy wires were added as the post had become unstable, and four metres of the Holme Post are now exposed which provides impressive evidence of the extent to which the ground has subsided. Sea level is close to the level of the collar to which the guys are attached, and this is now the lowest land in Britain at about 2.75m (9.5 ft) below sea level. Access to the reserve is via minor roads, first for 1km north from the B660 at Holme, and then turning right (north-west) for another 1.5km. The post is on the right hand side of the road. The town of Yaxley is seven km to the north-west and Peterborough is 12 km to the north. The grid reference of the Holme Post is TL 202 893.